LOS ANGELES—The grave implications of his vanity dawning on him, local man Ed Paitz realized what an arrogant fool he’s been after skipping the moving walkway at Los Angeles International Airport, sources said Thursday. 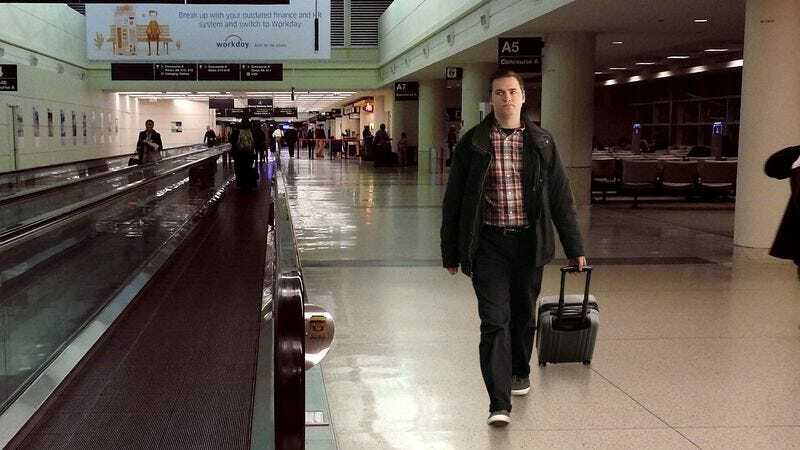 “My god, what have I done?” said a despairing Paitz, realizing that, alas, he must live with the sorrowful consequences of his own hubris and proceed down the carpeted corridor on his own two feet, watching in shame as other travelers with the humility to board the conveyor platform flowed past him with ease. “My pride—my accursed pride—has brought me to this! Like Icarus and Arachne before me, let my tale serve as a warning to all those who would surrender to the vile temptations of the ego.” At press time, redemption lay at hand, as the moving walkway was ending with a small gap before the next one began.